You’ll experience all four seasons in the Magic Valley, from snowy winters to sun-dappled autumns to vibrant springs to dry, warm summers. Our semi-arid climate offers plenty of sunshine year-round. Our amazing high-desert geography is lined with deep canyons, rolling hills, ancient volcanic formations, and geology that attracts scientists from around the world. 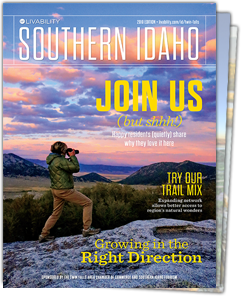 Southern Idaho is criss-crossed by the Snake River and its many tributaries, offering fine fishing and water sports opportunities.